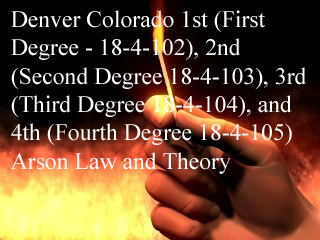 Denver Colorado 1st (First), 2nd (Second), 3rd (Third), 4th (Fourth) Degree Arson Criminal Defense Lawyer Explains Arson Law and Defenses – In Colorado – arson can be a very serious crime and is one of the most serious crimes in the property crimes category. Because arson cases are complex – many police departments and private insurance companies spend many thousands of dollars proving them. Defending these cases must be aggressive as they tend to turn – not on direct evidence such as eyewitness testimony – but on circumstantial evidence – much of it scientific. Fire experts in these cases often make the difference between a successful defense based upon reasonable doubt and a conviction followed by a lengthy jail sentence. Experts determine whether accelerants were used to start enhance the fire and to determine the source of the fire. Private retained investigators can also be used to bridge the gaps in the investigations conducted by the state of Colorado. Which witnesses were interviewed – which were not – and why. Investigators determine what, if any motives existed to set the fire – are there alternate suspects in the case if arson is proven – as well as pursuing many other leads normally generated in these cases are followed up. It is BECAUSE the evidence in fire cases is usually circumstantial that a creative and thorough knowledge of the law in arson defense is critical. Experts can testify that a suspect could not have set the fire (alibi) or that the fire was accidental (accident – not intentional). If a fire is the result of an accident – it is not a crime – it is negligence and you can’t be convicted of this charge. A clothing iron left on – candles carelessly set a fire, a defective space heater, a gas leak, a cigarette carelessly left on a couch or other piece of furniture. If Intent Is Established – How Do I Fight a Colorado Arson Charge? Arson cases usually involve few if any eye – witnesses and the “fire-starting devices” are often completely destroyed in the fire itself. There must exist evidence that can prove you guilty beyond a reasonable doubt – something that directly ties you to the fire before a jury will find you guilty. Others may have committed the crime and you are mistakenly targeted from the start with setting the fire. Falsely accusing you of arson or reckless burning may happen because another accidentally started the fire and was afraid to suffer the consequences or they intentionally started the fire and are pointing at you to cover up their own involvement. Perhaps someone identified you because that fit the description of the arsonist. A car just like yours was seen leaving the scene, since it is your property some of your belongings were found in the fire… All of these possibilities can explain why you were unfairly targeted. 1. A person who knowingly sets fire to, burns, causes to be burned, or by the use of any explosive damages or destroys, or causes to be damaged or destroyed, any building or occupied structure of another without his consent commits first degree arson. 2. First degree arson is a class 3 felony. 3. A defendant convicted of committing first degree arson by the use of any explosive shall be sentenced by the court in accordance with the provisions of section 18-1.3-406. 1. A person who knowingly sets fire to, burns, causes to be burned, or by the use of any explosive damages or destroys, or causes to be damaged or destroyed, any property of another without his consent, other than a building or occupied structure, commits second degree arson. 2. Second degree arson is a class 4 felony, if the damage is one hundred dollars or more. 3. Second degree arson is a class 2 misdemeanor, if the damage is less than one hundred dollars. 1. A person who, by means of fire or explosives, intentionally damages any property with intent to defraud commits third degree arson. 1. A person who knowingly or recklessly starts or maintains a fire or causes an explosion, on his own property or that of another, and by so doing places another in danger of death or serious bodily injury or places any building or occupied structure of another in danger of damage commits fourth degree arson. 2. Fourth degree arson is a class 4 felony if a person is thus endangered. 3. Fourth degree arson is a class 2 misdemeanor if only property is thus endangered and the value of the property is one hundred dollars or more. If people are home during an attempted arson and are at a substantial risk of serious bodily injury or death, the DA may add attempted murder charges which would mean facing a mandatory prison sentence. The importance of knowing how to cross-examine the prosecution’s expert witnesses and to effectively challenge the circumstantial and direct evidence in an Arson case is critical. Can they actually prove that you (1) intentionally (or even recklessly) set a fire, or (2) that you were even responsible for the incident. The fire investigators assigned to investigate a fire are almost always the expert witnesses who testify. An experienced Colorado Arson Defense Lawyer will obtain – not only all of the files of these investigators – but all of the insurance company and fire chiefs files – looking for any and all exculpatory evidence (evidence of innocence). Evidence intentionally discounted or even ignored by the prosecutions experts – or evidence that was dismissed or perhaps not even considered by the prosecution’s experts – can be devastating to the state’s case. The experts base their testimony at trial most often on “experience and training” and not necessarily accepted science and scientific protocol. The scientific standards laid our in the National Fire Protection Association (NFPA) “NFPA 921 Guide for Fire and Explosion Investigations” is the standard against which all suspicious fire investigations are measured. conducting an investigation of a fire scene. The kind of unproven “rules of thumb” used by fire investigators should have been replaced by a scientific procedure for the investigation from start to finish. It should be the first tool used by a Colorado criminal defense lawyer in the all important cross examination of the fire investigator(s) at trial. Standard 1.3.45 – The scientific definition of “fire”. Standard 2.3.1 – The first step in any investigation is to determine cause. Standard 2.3.4 – Inductive reasoning should be used to analyze only objective facts. Standard 2.3.5 – A theory of the origin of the fire’s cause must be based only on objective facts. Standard 2.3.6 – Any theory of the origin of the fire must be tested against all known facts, both objective and subjective. A finding of “undetermined” means that the existing theories do not meet the meet the tests in the standards. Standard 3.1 – All available technical literature to interpret the evidence. Standard 16.2.5 – A theory of origin based on the “elimination of all accidental causes” is rarely justifiable scientifically. Standard 19.4.8 – Motive and opportunity are separate inquiries that should be made ONLY AFTER the initial inquiry into whether the fire was a set one. Motive is not intent but points to those who are suspects, – that is – they had a reason to set the fire. Motive is NOT to be used in the first inquiry. Second – Did this defendant set it intentionally. A weak evidentiary case should not be “bolstered” by evidence of motive. Weak causation evidence should not be used to fool a jury into overlooking hard scientific evidence! If the incendiary stage fails – the case should end with a motion for judgment of acquittal. ABOUT THE AUTHOR: H. Michael Steinberg – Email The Author – A Denver Colorado Arson Crimes Criminal Defense Lawyer – or call his office at 303-627-7777 during business hours – or call his cell if you cannot wait and need his immediate assistance – 720-220-2277. If you are charged with A Colorado crime or you have questions about the topic of this article Denver Colorado 1st (First Degree – 18-4-102), 2nd (Second Degree 18-4-103), 3rd (Third Degree 18-4-104), and 4th (Fourth Degree 18-4-105) Arson Law and Theory, please call our office. The Law Offices of H. Michael Steinberg, in Denver, Colorado, provide criminal defense clients with effective, efficient, intelligent and strong legal advocacy. We can educate you and help you navigate the stressful and complex legal process related to your criminal defense issue. Colorado Defense Lawyer H. Michael Steinberg provides solid criminal defense for clients throughout the Front Range of Colorado – including the City and County courts of Adams County, Arapahoe County, City and County of Boulder, City and County of Broomfield, City and County of Denver, Douglas County, El Paso County – Colorado Springs, Gilpin County, Jefferson County, Larimer County, and Weld County,…. and all the other cities and counties of Colorado along the I-25 Corridor… on cases involving the topic of this article Denver Colorado 1st (First Degree – 18-4-102), 2nd (Second Degree 18-4-103), 3rd (Third Degree 18-4-104), and 4th (Fourth Degree 18-4-105) Arson Law and Theory.